Background:“Saving Mothers Score” (SMS) was developed and validated as a comprehensive obstetric score for identification of sick mothers. This study aimed to evaluate the efficacy of the SMS chart to predict maternal morbidity and improve maternal and fetal outcomes. Materials and Methods: A single-center randomized study was done on 700 subjects of two groups from February 2017 to 2018. The subjects were treated as per the existing hospital norms in Group A (n = 360) and SMS chart was used in addition to the hospital norms in Group B (n = 340). Results: Demographic data, preterm deliveries, and cesarean delivery rate were not significantly different in both groups. Postpartum hemorrhage was significantly more in Group A when compared with Group B where SMS chart was used (unadjusted odds ratio 3.22, 95% confidence interval: 1.59, 6.97, P = 0.0004). The overall morbidity was higher (P = 0.0001) in Group A. The mean hospital stay was longer in Group A (P = 0.0001). Neonatal morbidity was 14.4% in Group A and 10.3% in Group B (P = 0.169). APACHE II (mean 10.87, range 0–18) and SOFA (mean 7.75, range 0–12) scores were determined along with SMS (mean 18.87, range 5–26) in eight critically ill parturients. There was no maternal mortality in this series. Conclusion: SMS predicts maternal morbidity and can help initiation of appropriate treatment to improve maternal and hence fetal outcome. Multicentric studies are needed for further evaluation and comparison of SMS to APACHE II and SOFA scores. Severe maternal morbidity is defined as unintended outcomes of labor and delivery resulting in short and long consequences to women's health. Scores such as Maternal Early Obstetric Warning Score (MEOWS) and Maternal Early Warning Trigger (MEWT), and Maternal Early Warning Criteria (MERC) help recognize conditions that contribute to maternal morbidity and mortality.,, The Saving Mothers Score (SMS) was developed for early identification of at-risk pregnant women based on a combination of pregnancy-related risk factors, physiological variables, and biochemical tests. The effectiveness of the SMS chart in reducing maternal morbidity is described in this study. Briefly, the SMS scoring system was formulated based on MEOWS and was made more comprehensive by including 33 items pooled into three parameters: pregnancy-related risk factors, physiological variables, and biochemical tests. Pregnancy-related risk factors were given a bicolor coding with a simple yes or no as the potential response (orange denotes risk factor and green indicates no risk). Each parameter was given a score of 1. The presence of ≥4 oranges at any time during pregnancy indicates a high-risk pregnancy. Eight physiological parameters were identified (blood pressure, pain, temperature, pulse, respiratory rate, saturation (SpO2), urine output, and neurological status of the patient). A triple color coding, weightage, and score was assigned to each one of them. Respiratory rate and conscious level were given a weightage of 2. Other parameters were given a weightage of 1. Eight biochemical parameters were identified, color-coded, and given scoring depending on the severity of derangement. A healthy pregnant woman was color-coded as green with a score of 0–3. Those at a moderate risk/needing high-dependency unit (HDU) care were color-coded orange and had a score of 3–5. Sick pregnant women/high-risk/needing intensive care unit (ICU) care were color-coded red and had a score of ≥6. 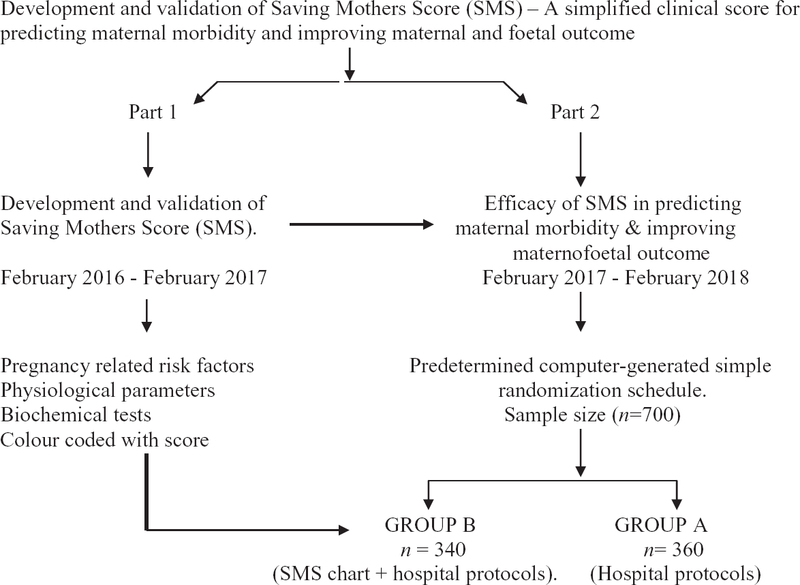 A single-blind, randomized clinical trial design was done to evaluate the effectiveness of the SMS chart to reduce maternal morbidity and improve maternal and fetal outcomes. The study was done at a single-center tertiary obstetric care institute. The institutional ethics committee approved the study protocol, which was also registered with the Clinical Trial Registry-India. The sample size (n = 700) for the study was estimated, using the Raosoft software, based on a 35% prevalence of hypertensive disorders of pregnancy, a 1:1 ratio between groups, 95% confidence intervals (CIs), and 5% margin of error. The study included pregnant women of all ages between 6 weeks of gestation and up to 6 weeks postpartum, American Society of Anaesthesiologists Grade I–Grade IV, admitted to the obstetric wards of the study institute. The study excluded pregnant women managed as outpatients, women admitted for termination of pregnancy or miscarriage or tubectomy, gestational age <6 weeks at enrolment, women without ultrasound confirmation of pregnancy at gestational age 6 weeks, and mothers who are >6 weeks postpartum. Eligibility for the study was confirmed by the principal investigator for the study prior to enrolment. Eligible subjects were randomly allocated to one of two groups using a predetermined computer-generated simple randomization schedule. The randomization slips were sealed in an opaque envelope and opened by a nurse not related to the study after eligibility for enrolment was confirmed. Women randomly allocated to Group A were managed as per the existing hospital protocols for care. Women randomly allocated to Group B were monitored according to SMS chart (on admission, 6, 12, 24, 36, and 48 h) in addition to management based on existing hospital protocols for care. All subjects were masked to the group allocations. Clinical care parameters including demographic data, details of pregnancy, pregnancy-related risk factors, and mode of delivery were retrieved from the study institute case records or SMS chart. Any morbidity in the form of obstetric hemorrhage and its complications (transfusion of blood and blood products, surgical intervention for bleeding), complications of hypertensive disorders of pregnancy (uncontrolled blood pressures; eclampsia; hemolysis, elevated liver enzymes, low platelets; neurological sequelae), sepsis, surgical site infections, pulmonary edema, respiratory infections, and ICU admissions were noted in both the groups. The neonatal morbidity in the form of APGAR <6 and neonatal ICU admissions were noted. Any maternal or neonatal mortality was noted. The overall hospital stay was observed for both the groups. Details of women who developed multiple-organ dysfunction and shifted to a medical ICU for further care were also noted in both the groups. Statistical analysis was done using Stata statistical software version 10 (College Station, TX, USA). Demographic data, pregnancy-related risk factors, and obstetric interventions of women in the two groups were compared for any significant differences using a bivariate analysis. Estimates of outcomes that included maternal and fetal morbidity and mortality were compared between the two groups. SMS scoring was further compared with APACHE II and SOFA scores in critically ill parturients admitted in obstetric ICU during the study period. A P value of <0.05 was taken as statistically significant. In all, 700 women admitted in the obstetric ward of the study institute between February 2017 and February 2018 were randomly allocated [Figure 1] to two groups – Group A (n = 360) and Group B (n = 340). The demographic characteristics [Table 1] and pregnancy-related risk factors [Table 2] of the two groups were not significantly different. The incidence of hypertensive disorders of pregnancy was 25.8% in Group A and 26.47% in Group B. The mode of delivery and the cesarean delivery rate were comparable in both the groups (50.6% vs 44.1%; P = 0.36). The assisted vaginal delivery rate was low in both groups (eight in Group A when compared with six in Group B) and was not statistically significant [Table 3]. 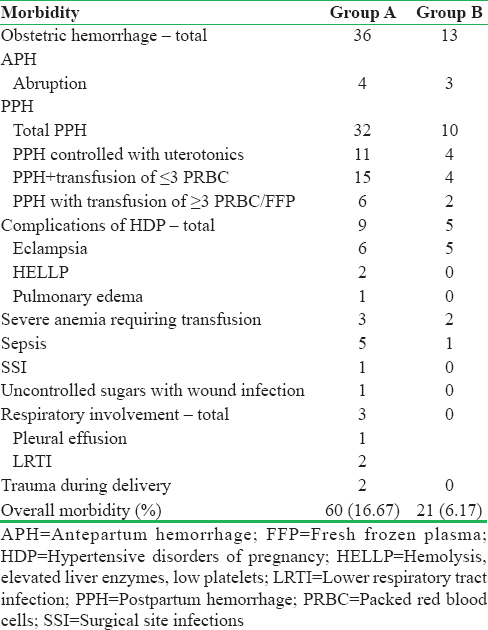 The most common morbidity was postpartum hemorrhage (PPH) [Table 4]. PPH was significantly more in Group A (unadjusted odds ratio 3.22, 95% CI: 1.59, 6.97, P = 0.0004). The overall morbidity was more in Group A (n = 60; 16.67%) than in Group B (n = 21; 6.17%), which was statistically significant (P = 0.0001). The mean hospital stay was 6.96 days (standard deviation 4.034 days) in Group A. The mean hospital stay was significantly less in Group B [P = 0.0001, [Table 5]. APGAR scores, birthweight, neonatal morbidity, and mortality and neonatal intensive care unit (NICU) admissions did not differ significantly between the two groups [Table 5]. The mean SMS (range) at admission to ICU for eight critically ill women was 18.87 (range 5–26) and was comparable to APACHE II (mean 10.87, range 0–18) and SOFA scores (mean 7.25, range 0–12) for these eight women. Statistical tests were not done to compare SMS, APACHE II, and SOFA scores due to the limited number of cases. The mean duration of hospital stays in patients with SMS ≤10, 11–20, and 21–30 was 7, 9.5, and 11.5 days, respectively. Two of the patients admitted in obstetric ICU were transferred to medical ICU for multiorgan support. Patients who returned to SMS ≤6 within 3 days had a shorter ICU as well as hospital stay, early discharge home, and lesser morbidity. There was no mortality in our study. Delays in recognition, diagnosis, and treatment contribute to 40%–50% of maternal deaths. The majority of maternal mortality is due to direct obstetric causes (82%) in India, and two-thirds of maternal mortality can be attributed to late referrals in a critical medical condition. The study showed an improvement in maternal outcome as reflected by lesser obstetric interventions (emergency cesarean section) and lower incidence of PPH, and lower number of blood transfusions in the group that was monitored with SMS. There was a significant reduction in the number of women with overall maternal morbidity. Maternal morbidity was further assessed by the prolongation of hospital stay, with significant reduction in hospital stay in the group monitored with SMS. Neonatal outcomes did not differ significantly between groups. The group monitored with SMS had lower NICU admissions with lower neonatal morbidity and neonatal mortality although these differences were not statistically significant. The studies on the effect of implementation of various EWS had varied results. Isaacs et al. conducted a national postal survey about the use of an EWS by querying 205 lead obstetric anesthetists. About 91% of them (119) agreed that early warning systems helped to prevent obstetric morbidity. Mackintosh et al. expressed an uncertain role of MEOWS in routine use and in patients with low morbidity risks. The study by Shields et al. on the implementation of MEWT showed that the use of the MEWT tool resulted in significant reductions in severe maternal morbidity (P < 0.01) and composite morbidity (P < 0.01). Modifications of EWS may help early recognition and reduce the seriousness of maternal morbidity in obstetric HDU and may be useful in critically ill patients for the prediction of maternal death. Carle et al. designed and internally validated an aggregate weighted early warning scoring system specific to the obstetric population that has the potential for use in the ward environment. They concluded that the new clinical obstetric EWS has an excellent ability to discriminate survivors from nonsurvivors in the ICU settings. The study has certain strengths and limitations. The study design that used a predetermined, computer-generated randomization schedule is a strength of the study. The comparable demographic and pregnancy risk factors of the two groups indicates the strength of the randomization process. The study center is a subspecialty tertiary care center focused on pregnant women and neonates and lacks multispeciality multidisciplinary care facilities. This results in the early referral of medical disorders complicating pregnancy, to other multi-disciplinary tertiary care centers. This limitation restricted obstetric ICU admissions and our scope to compare SMS scoring with APACHE II and SOFA Scores. The single-blind design of the trial introduces a scope for bias. It is possible that the direct involvement of the anesthesiologist as the primary investigator might have enhanced the care in the group where the SMS chart was applied. We found that SMS chart helped in early identification of maternal morbidity, initiation of appropriate treatment at appropriate time, and resulted in significant improvement in maternal morbidity and maternal outcome. The risk prediction started with pregnancy-associated risk factors and was supported by the deranged physiological and biochemical parameters. The comparison of SMS to APACHE II and SOFA score in predicting maternal mortality needs further evaluation of the score in obstetric ICU. American College of Obstetricians and Gynecologists and the Society for Maternal–Fetal Medicine, Kilpatrick SK, Ecker JL. Severe maternal morbidity: Screening and review. Am J Obstet Gynecol 2016;215:B17-22. Merriel A, Murove BT, Merriel SW, Sibanda T, Moyo S, Crofts J, et al. Implementation of a modified obstetric early warning system to improve the quality of obstetric care in Zimbabwe. Int J Gynaecol Obstet 2017;136:175-9. Mhyre JM, DʼOria R, Hameed AB, Lappen JR, Holley SL, Hunter SK, et al. The maternal early warning criteria: A proposal from the national partnership for maternal safety. Obstet Gynecol 2014;124:782-6. Friedman AM. Maternal early warning systems. Obstet Gynecol Clin North Am 2015;42:289-98. Clark SL, Belfort MA, Dildy GA, Herbst MA, Meyers JA, Hankins GD, et al. Maternal death in the 21st century: Causes, prevention, and relationship to cesarean delivery. Am J Obstet Gynecol 2008;199:36.e1-5. Montgomery AL, Ram U, Kumar R, Jha P, Million Death Study Collaborators. Maternal mortality in India: Causes and healthcare service use based on a nationally representative survey. PLoS One 2014;9:e83331. Al-Foudri H, Kevelighan E, Catling S. CEMACH 2003–5 saving mothers' lives: Lessons for anaesthetists. Contin Educ Anaesth Crit Care Pain 2010;10:81-7. Centre for Maternal and Child Enquiries. Saving Mothers' Lives: Reviewing Maternal Deaths to Make Motherhood Safer: 2006–08. The eighth report on confidential enquiries into maternal deaths in the United Kingdom. Br J Obstet Gynaecol 2011;118:1-203. Neligan PJ, Laffey JG. Clinical review: Special Populations-critical illness and pregnancy. Crit Care 2011;15:227. Edwards SE, Grobman WA, Lappen JR, Winter C, Fox R, Lenguerrand E, et al. Modified obstetric early warning scoring systems (MOEWS): Validating the diagnostic performance for severe sepsis in women with chorioamnionitis. Am J Obstet Gynecol 2015;212:536.e1-8. Singh S, McGlennan A, England A, Simons R. A validation study of the CEMACH recommended modified early obstetric warning system (MEOWS). Anaesthesia 2012;67:12-8. Singh A, Guleria K, Vaid NB, Jain S. Evaluation of maternal early obstetric warning system (MEOWS chart) as a predictor of obstetric morbidity: A prospective observational study. Eur J Obstet Gynecol Reprod Biol 2016;207:11-7. Main EK, Abreo A, McNulty J, Gilbert W, McNally C, Poeltler D, et al. Measuring severe maternal morbidity: Validation of potential measures. Am J Obstet Gynecol 2016;214:643.e1-10. Isaacs RA, Wee MY, Bick DE, Beake S, Sheppard ZA, Thomas S, et al. Anational survey of obstetric early warning systems in the United Kingdom: Five years on. Anaesthesia 2014;69:687-92. Mackintosh N, Watson K, Rance S, Sandall J. Value of a modified early obstetric warning system (MEOWS) in managing maternal complications in the peripartum period: An ethnographic study. BMJ Qual Saf 2014;23:26-34. Shields LE, Wiesner S, Klein C, Pelletreau B, Hedriana HL. Use of maternal early warning trigger tool reduces maternal morbidity. Am J Obstet Gynecol 2016;214:527.e1-6. Austin DM, Sadler L, McLintock C, McArthur C, Masson V, Farquhar C, et al. Early detection of severe maternal morbidity: A retrospective assessment of the role of an early warning score system. Aust N Z J Obstet Gynaecol 2014;54:152-5. Paternina-Caicedo A, Miranda J, Bourjeily G, Levinson A, Dueñas C, Bello-Muñoz C, et al. Performance of the obstetric early warning score in critically ill patients for the prediction of maternal death. Am J Obstet Gynecol 2017;216:58.e1-8. Carle C, Alexander P, Columb M, Johal J. Design and internal validation of an obstetric early warning score: Secondary analysis of the intensive care national audit and research centre case mix programme database. Anaesthesia 2013;68:354-67.